Pizza Inn Inc. announced that veteran franchisee and Mississippi area developer Bob Singh of Greenwood, Mississippi, who has been with the system for more than 30 years, signed a new Area Development Agreement, committing to another 20 years. The new agreement calls for additional locations to be developed and was secured by a development fee. "It's the ultimate endorsement for Pizza Inn that a leader like Bob, who could easily retire, wants to continue growing his success and the success of our franchise network," says Charlie Morrison, president and CEO of Pizza Inn. Singh, 56, who immigrated to the U.S. at the age of 21, quickly found a home in foodservice, where he went from flipping burgers to opening restaurants. He opened his first Pizza Inn in 1979. Today he owns five Mississippi Pizza Inn locations in Collins, Greenwood, Grenada, Monticello, and Hattiesburg and one Louisiana location in Franklinton, in addition to a portfolio of other franchise brands. And he isn't done growing. "The Pizza Inn restaurant of today is incredibly exciting, and I've been around long enough to know a great opportunity," Singh says. His newest Pizza Inn store in Hattiesburg is an example of Pizza Inn's new restaurant prototype. 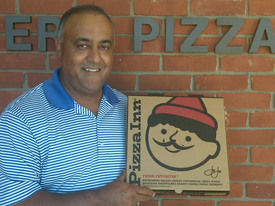 Singh loves the concept and is supportive of where the Pizza Inn brand is headed and how he can champion the system with his own stores and the development of others in his territory. He also credits Pizza Inn's new corporate-owned locations as a symbol of leading by example to prove the franchise concept at a grassroots level that he embraces.